Digiarty announced full support for the New iPad 3. Now is the chance for all iPad iPhone and iPod owners to join in the multimedia feast with lifetime free upgrade. Recently, Digiarty Software, Inc announced full support for the third-generation iPad once it was released by Apple officially. A series of profile options for the new iPad have been added into Digiarty's DVD ripper and video converter software so far. From now on, the New iPad 3 owners are included in the group of enjoying any HD videos and DVD videos on the New iPad's Retina Display. When the number of new iPad ownership reached remarkably 3 million, Digiarty team was not reconciled to standing still. Soon, they added coordinated profiles for the newly released Apple Tablet in WinX DVD Ripper Platinum and WinX HD Video Deluxe, without raising the price a bit. A format limit-free solution especially for iPad 3 is thereby generated to let the large amount of owners make full use of higher-resolution Retina Display, longer battery life, A5X prosessor, 4G LTE and iOS 5.1 on their new gadgets. Support outputting 1080P videos, support iPad 3 HD retina display. "Our surcharge rule will continue even when more features are available for the next generation iPad and iPhone (hopefully iPhone 5)." According to the words from Jack, the general director of Digiarty team, "Now is the chance for all new iPad users, together with iPad/iPad 2, iPhone and iPod owners to join in the multimedia feast with lifetime free upgrade." Among the upgraded programs for both Mac and Windows users, WinX DVD Ripper Platinum and HD Video Deluxe are the "Key Players". As qualified and recognized software for years, they are in the leading positions in video backup industry for ripping DVD to AVI (DivX, Xvid), MP4, MPEG, WMV, MOV, FLV, 3GP, etc, cloning DVD to ISO image, VIDEO_TS folder or MPEG2 file, converting MKV, M2TS, AVCHD, AVI, MP4 and FLV Videos. They also enables video playback on iPad, iPhone, iPod, Apple TV, Android, Galaxy Tab, PSP, etc. New functions, old prices. With the compatibility for the New iPad, the prices of these two software remain unchanged. Digiarty Software, Inc. is specialized in multimedia software based on Windows, Mac OS and iOS5, which provides personal and home used video audio software across Apple iPhone, iPad, Sony PSP, PS3, Xbox, Droid platforms and devices, including DVD Ripper, Blu-ray Decrypter, HD Video Converter, DVD Author, and DVD Copy, etc. WinX DVD Ripper PlatinumRip DVD to AVI,MP4,H.264,WMV,iPhone/4S,iPad,Android Phone,etc.Copy DVD to ISO. 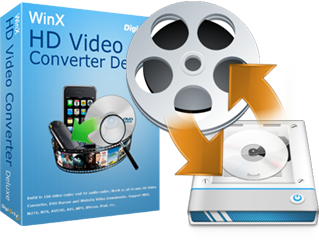 WinX HD Video Converter DeluxeConvert between MKV, AVCHD, M2TS, AVI, MP4, WMV, etc. Convert various videos to iPhone, iPad, Android, PSP, PS3, Xbox, etc.